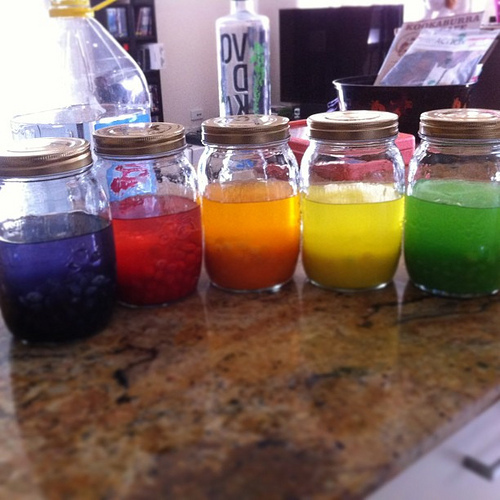 Honey & Butter: Skittles Vodka! Candy infused vodka couldn't be easier. It's fun to create your own flavors and flavor mixes and use them for favorite cocktails.....Skittles Cosmo anyone? Fill mason jars 3/4 of the way with the vodka. Separate the skittles flavors into separate flavors or your special flavor mixes. Add about 1/3 of a cup of each flavor to each jar. Place cover on tight and shake. Allow to sit at least 24 hours until skittles have dissolved, shaking periodically. Strain the infused vodka through coffee filter and return liquid to the jar. Enjoy!